RGB-D sensors have become very popular for 3D reconstruction, in view of their low cost and ease of use. They deliver a coloured point cloud in a single shot but the resulting shape often misses thin geometric structures. This is due to noise, quantisation and the coarse resolution of the depth map. Using these data the method „single depth image super-resolution“ creates a depth profile by estimating the data in a better resolution. The result is rarely of a sufficient quality. In comparison, the quality of the compansion RGB image is substantially better. A method for retrieving geometry from a single colour image is called shape-from-shading. The resulting depth profile is not satisfactory either. Combinig both methods requires the RGB and depth images to have the same resolution. The resolution of the depth image thus remains a limiting factor in single-shot RGB-D sensing. 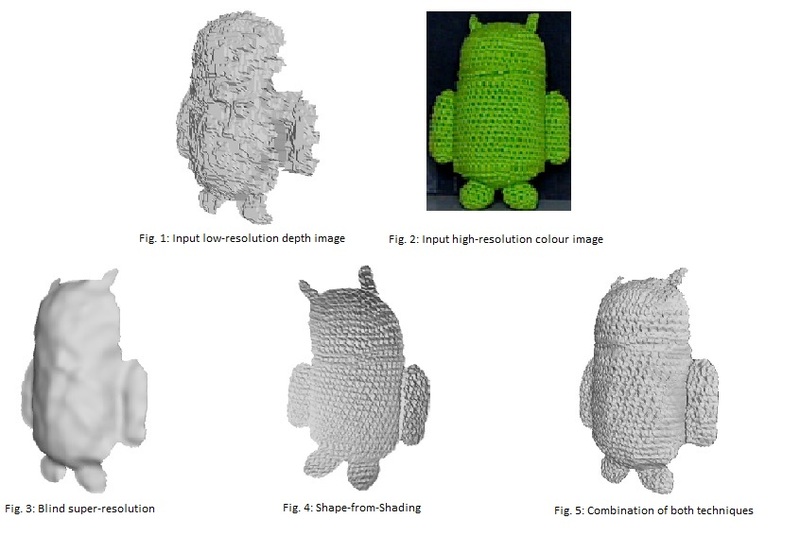 The innovation aims at breaking this barrier by jointly refining and upsampling the depth map using shapefrom shading. A Bayesian approach yields a non convex variational problem which is solved using a dedicated ADMM (alternating direction method of multipliers) algorithm.